The changing way in which Americans buy groceries has consequences for cashiers, for stores, for consumers. But now comes news that the rise of online shopping and automated self-checkout stations has claimed an unexpected victim: impulse snack buys. 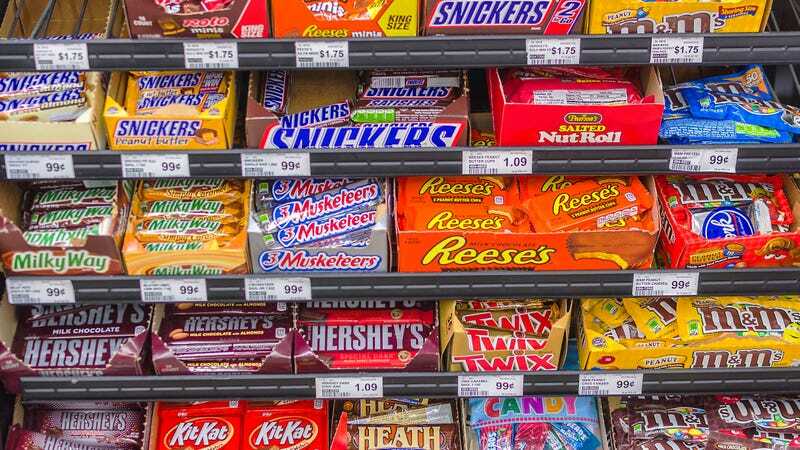 Food Navigator reports on Euromonitor data showing Americans’ checkout-line candy and snack grabs are seeing a downturn thanks to, well, the decline of checkout lines. According to Euromonitor analyst Jared Koerten, 70 percent of snack purchases are unplanned, likely the result of your bored eyes coming to rest on that Kit-Kat as you wait for a cashier to ring up the rest of your groceries. “The problem with self-checkouts is you’re wholly engaged in the checkout process. I don’t have that moment to look around,” Koerten said at the recent Sweets & Snacks Expo in Chicago. And that’s if people even get to the store at all. The rise of online grocery ordering and delivery also sounds the alarm bell for snack companies, as you’re less likely to seek out candy bars online than you would be to grab one at the register. There’s one group who might be heartened by this news though: parents. When grocery shopping with my mom as a kid, I remember her essentially imprisoning my brother and I inside the metal cart to prevent us from throwing every packet of Fruit-Stripe gum onto the conveyer belt. Back in the day, with full suburban carts lined up five-deep at the register, this lingering at the checkout could take a full 10 minutes. That’s more than enough time to covertly swipe some gum, and maybe some Gushers while I was at it. It’s weird to think that this childhood transgression—trying to sneak snacks into the cart at checkout—will become an obsolete speck of childhood nostalgia.